One of three photos received from Mark Ward (UK). The pictures were taken at The Msins of Tanakie, a farm at Port Gordon Scotland. The man in the driving seat of SA2 is George Mckay a farmer and contractor who owned 3 steam engines. -- SA2 was an Aberdeen CC reg and our David Hales happens to know that it was first issued to James Grieve of Turriff, which was just the Aberdeen side of the Banff border. 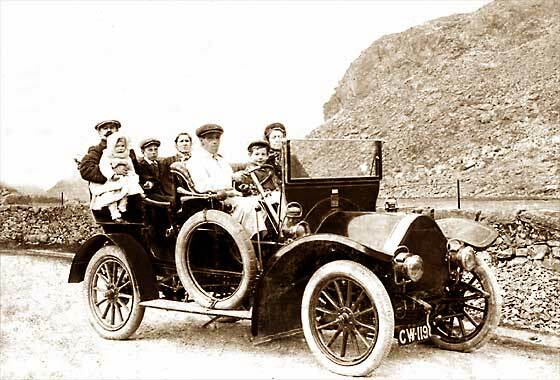 The car is very unusual, being a Twickenham London made cca 1900 New Orleans. Second of three photos received from Mark Ward (UK) taken as above and registered in Aberdeen. 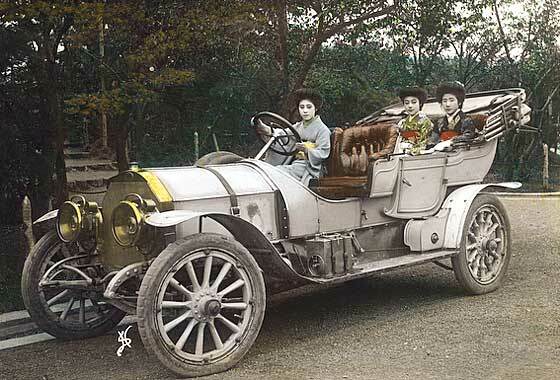 -- Same make of car as above, cca 1900 New Orleans Two Seater. Both are probably badged Belgian Vivinus by HG Burford in Twickenham, London. Subsequently made under licence. Bigger cars were called Orleans. Neither had connections with USA but named after address Orleans Road, which in tern was named after the estate of the exiled Duc d'Orleans, 1830, short while King of the French. Intriguing photo c1910 sent to us by Michael Dixey (UK) of his great grandmother Annie, married to Dr Benjamin Duke, a GP who lived at Windmill House in Clapham Common. -- We had a lot of help but the definitive answer came from David Burgess-Wise in saying it is almost certainly a cca 1901 Gardner Serpollet Steamer. Serpollets at that period used various designs of condenser. The fitting beneath the condenser is a separator to remove oil from water before recycling. Third of three photos received from Mark Ward (UK) taken as above and registered in Aberdeen. -- SA5 was an Aberdeen CC reg. and would have been issued when registrations first began there in January 1904. 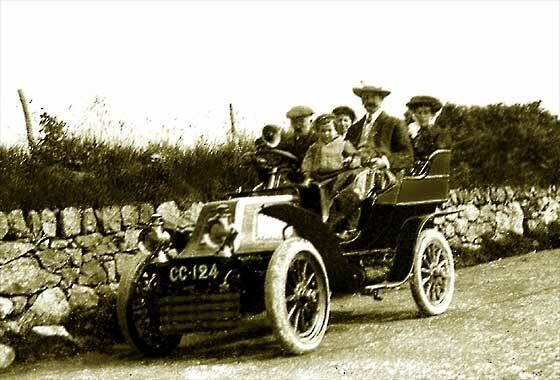 Cars already in use tended to be registered first which agrees with the dating of this as a cca 1903 Humberette Two Seater. 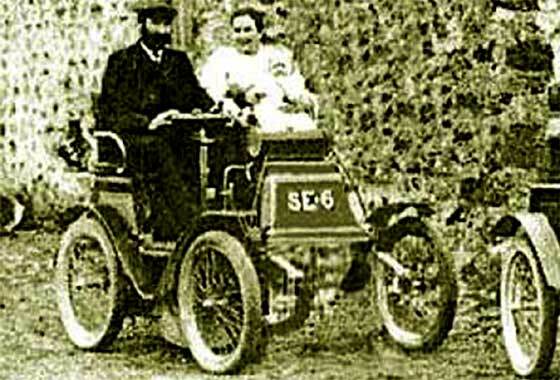 Humber began by making bicycles, then motorbikes and then cars. 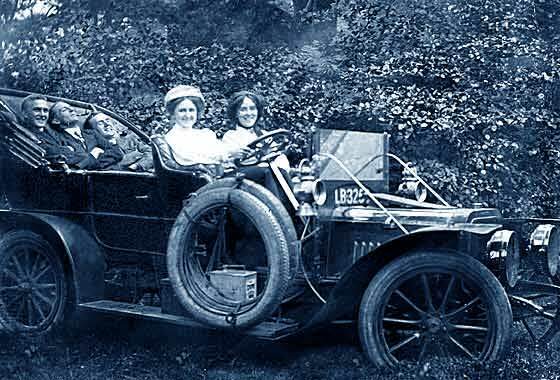 Humberettes (Humber voiturette) made in Coventry 1903-05 were first volume made UK cars. Two puzzling photos sent to us by Gillian Fynes (UK) believed to be GGFather or even GGGfather Darbyshire owning explosives company building Penmaenmawr tunnel in Wales. -- Our David Hales advised this is very unusual 8hp Progress (DDB engine) yellow & black tonneau, registered Caernarvon CC 3rd July 1905 to TC & RG Williams of Grenville House, Penmaenmawr and transferred to a Gladiator in 1907. Progress were liquidated 1903 so previously registered or follow-on 'West Aster'. Another photo that has done the international rounds was received from Kjeld Duits (Japan) who is the Japanese Correspondent for the Dutch press. He recently bought a very charming card of three Japanese women in kimono but could not work out what the car was. 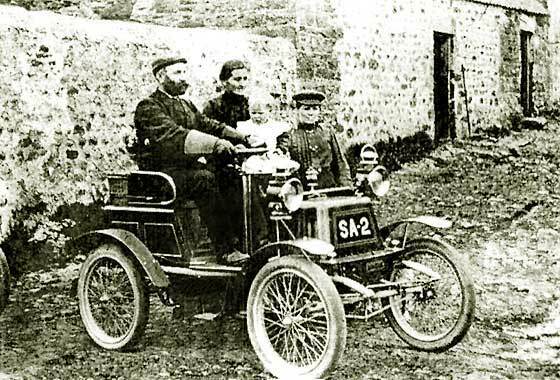 --We thought it was a FIAT, which was confirmed by our John Warburton saying he is confident that it was a 1905-7 FIAT 60hp six cylinder. The 'Speedster' type scuttle suggest a possible later American style body. Another photo which is not what it seems. Received from Doriel Laron (UK) researching family history and came across the attached photo in a set marked 1908. Grandfather, Jimmy Nye, is one of the 'jokers' in the back! The family were living in Dulwich at the time. Would it be possible for you to provide me with any information on the car? -- Reg is London 1908 but our John Warburton thinks it is a cca 1906 Darracq Tourer, probably imported when it was two+ years old. See similar car. 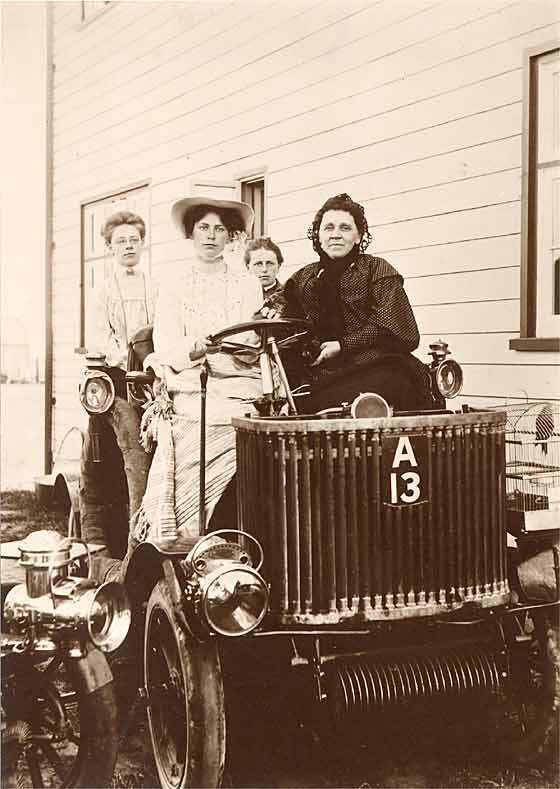 Formal photo from Jennifer Hudson Dunedin (New Zealand) of a family car taken in 1921 at Revingtons Hotel. Husband's great grandfather was an early settler in Dunedin starting a large chocolate and biscuit making businessn, now Cadburys. 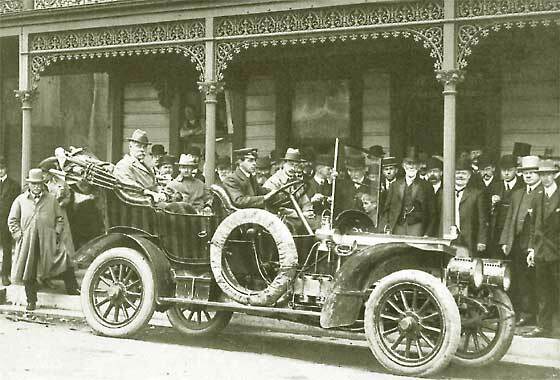 Similar photo, same car, same place but different people showed Lord and Lady Jellicoe, Governor General touring South Island of NZ. The Hudson's car was used for this event. Investigating but is a cca 1906 Talbot Tourer. Probably 24'30 4 cyl. TBA! Two puzzling photos sent to us by Gillian Fynes (UK) believed to be GGFather or even GGGfather Darbyshire owning explosives company building Penmaenmawr tunnel in Wales. 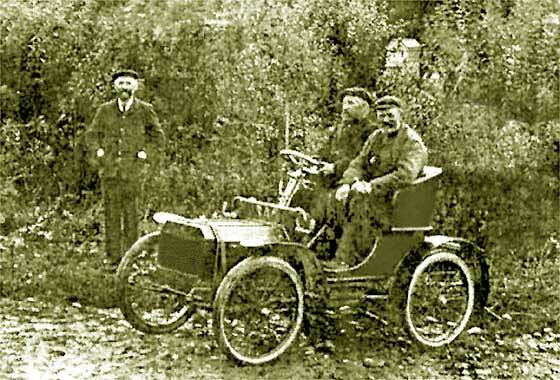 -- Ident has been confirmed by John Warburton and David Hales as cca 1906 Humber Tourer 16/20hp, or 15hp, or even 20hp. The single spoke steering wheel is typical of a Hhumber of the priod. The CW 119 Burnley CBC registration was first issued to a motorcycle in about May 1905. All very intriguing. Intriguing damaged photo posted on AACA by Huptoy (USA) taken in San Francisco about 1912. Grand father is in the passenger seat of what appears to be a large car as he was 6'6" tall. After the 1906 earth quake, he moved to CA from Green Bay, Wi in 1907. -- Picture has large sections missing but is recognisable by radiator as cca 1908 White Tourer and we repaired photo as such. White were into making sewing machines when junior in 1900 patented a steam car. Pres. Taft had one. Fascinating photo sent to us by Mikhail Katyshev from Almati (Kazakhstan) which he noted on a Russian 'armored' website. -- John Warburton noted the Belgian ref on the rad and sent photo to Malcolm Jeal, who had no doubt this was a Belgian 'Pipe' of around 1910, possibly biggest model, an 80cv of just over 11-litres. CBdCA in Brussels were then the largest car producer in Belgium, also made pipes and boilers, so the armoring may have been them & their boiler plating. 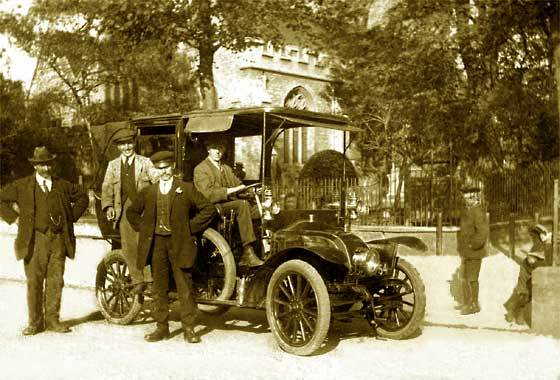 Lovely period photo sent to us by Roger Gould (UK) taken in Bedford outside St. Peter's Church. No date to the photo but probably some years after the taxi was made. -- First thought was that it was a Renault of the Taxi de la Marne type but our John Warburton thinks it is a Charron. Despite Charron generally having a taller rad filler, having a sloping rad top, and many having a petrol filler cap behind, the scuttle bonnet curves in the middle, unlike Renault angle. So cca 1910 Charron. Curious photo received from Doriel Laron (Israel), sorry for poor quality, asking if we can help identify this car from an old family photo? Believed taken in Austria around 1913. -- This looks like a 'special' constructed on an early chain drive light car 1902-5, (tubular chassis frame, very short wheelbase) modernised cca 1912 Special with a later radiator a la Clement, and teutonicish bodywork, and steering column moved back and inclined. Stubby tubular dumbirons, bit like a Darracq. Photo sent to us by Trevor Watson (UK) trying to identify the car. His mother is the child in white at the back held by his Grandmother. The driver is either Great uncle Percy Campion or his brother Norman. 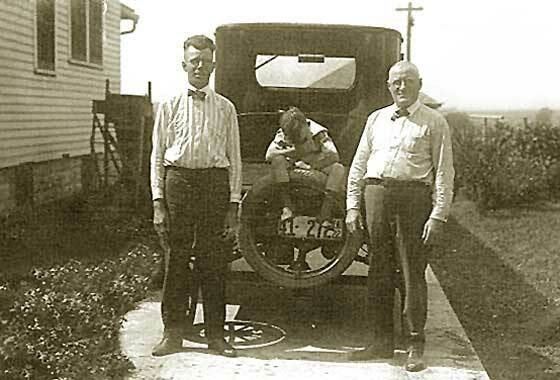 The front passenger is the third brother, Trevor's grandfather. Mother was born in 1924, and judging by her size, the photo was taken in 1926. 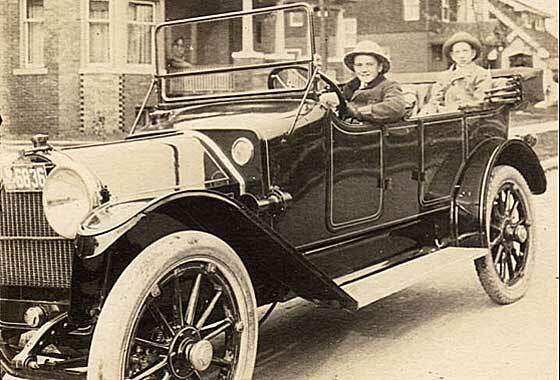 --Car is relatively easy to identify as it has a transverse front spring and the Warwick registration indicates it is a cca 1913 Ford Model T Tourer. Photo sent to us by Greg Blasingame (USA) of his grandfather in the front seat. 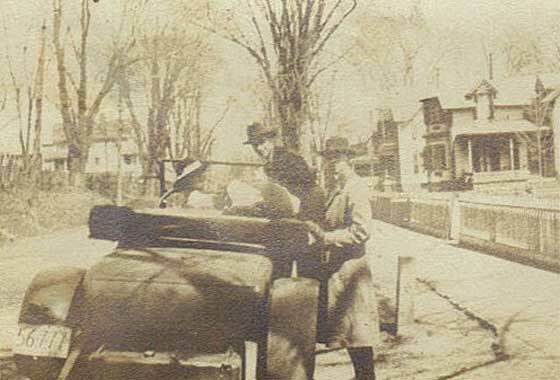 It says 1913 MICH on tag but he cannot find out what the car is. Any help would be nice. -- We can advise that the car is a cca 1913 Paige Detroit Model 36 Touring. Early Page-s were financed by Harry Jewett and designed by Bachie and promoted by Paige. Cars were rubbish, Paige was ousted and a new car was designed in 1911. The 36 introduced 1913. 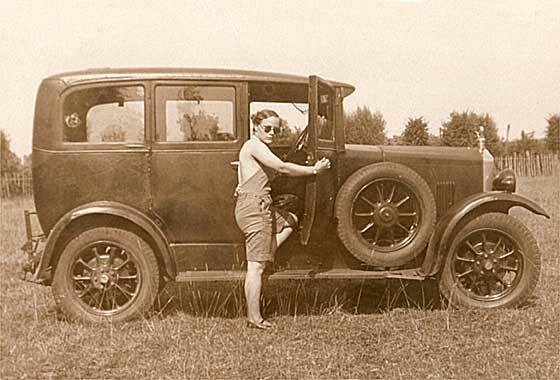 Jewett sold out to Graham-Paige Motor Corp. in 1927. Enquiry received from Christopher Koustakos (Cyprus) with friend in Larnaca who has a 1920s registered Rugby with a Fivet engine. -- Lots of people have looked at this and all agree that this has NO connection with Durant/Star/Rugby apart from the rad/badge. It is a definite 'bitsa' which seems to have no specific connection with any one car. Fivet engines were fitted to ACs and few others including Le Gui, as initials on rear hub, but chassis unlike Le Gui. Any help appreciated. 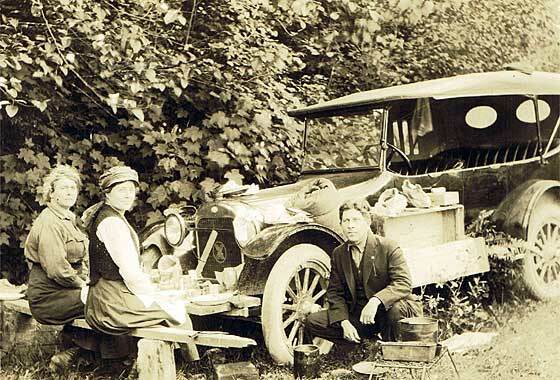 Lovely period photo posted on AACA by Rich Brown (USA) taken in western Washington state around 1918 or so. Can someone help with the make/model of this car? Looks like a Buick. -- No not a Buick, badge looks Oakland. Bit more research suggest an Oakland between 1918 large louvers and central light bar, and 1922 thin louvers and 1924 low light bar. 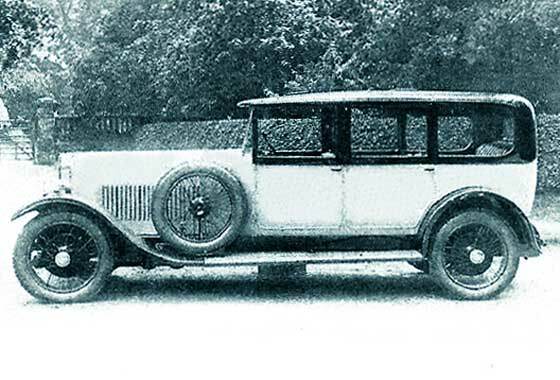 So cca 1920 Sensible Six Sports Touring. Oakland became General Motors and introduced the Pontiac brand, which killed Oakland. Two photos sent to us by Rosalie Cagnini (USA) saying she needs some help identifying the cars. -- This looks very much like a cca 1922 Ford Model T Coupe. Frank at the AACA points out the transverse spring parallel to the rear axle. 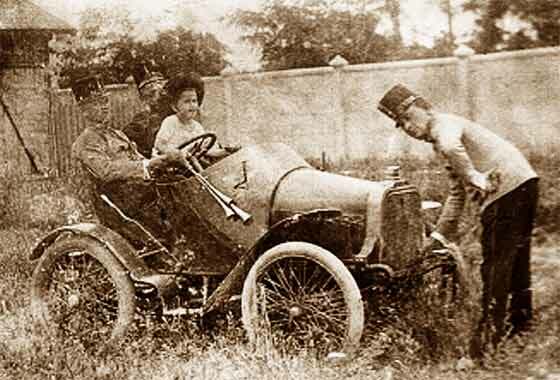 Manuel suggest that there appears to be a flat area at the back that the boy is sitting on, so a coupe. Keiser notes the three raised molding lines, one just under the window, one just at the intersection of the body/trunk and one at the rear edge of the trunk lid. Unusual photo posted by Burkhard from (Germany) purchased at a flea market in Austria and wants more information about. 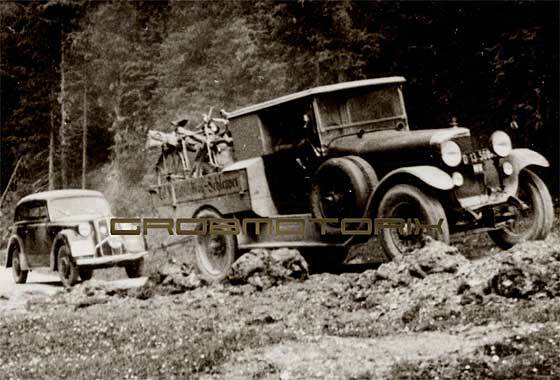 On the side "Katrschberg-Schlepper" meaning a recovery vehicle in the Katschberg mountains of Austria, doing its job of towing a late 30s Opel. -- The unusual radiatior and the double stacked Teutonic side/headlamps indicate a cca 1922 Austro Daimler of the AD 617 Tourer type designed by Porsche. This type rad was cca 1917 to '27. Lovely truck conversion. Picture found in an old book by Tony Oakes (UK) of a rather grand car. -- It is a cca 1927 Sunbeam 30'90 Saloon. Sunbeam started making bicycles and then the quirky Sunbeam-Mabley. 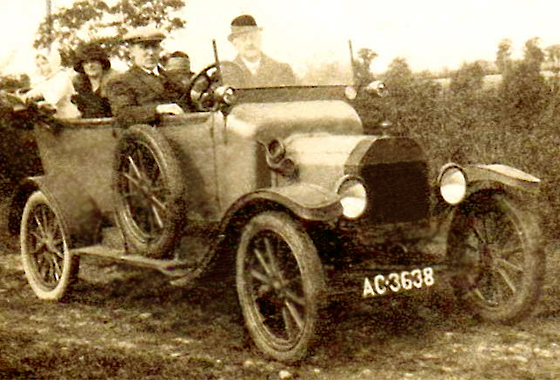 Mainstream cars were originally assembled Berliet 12HP. 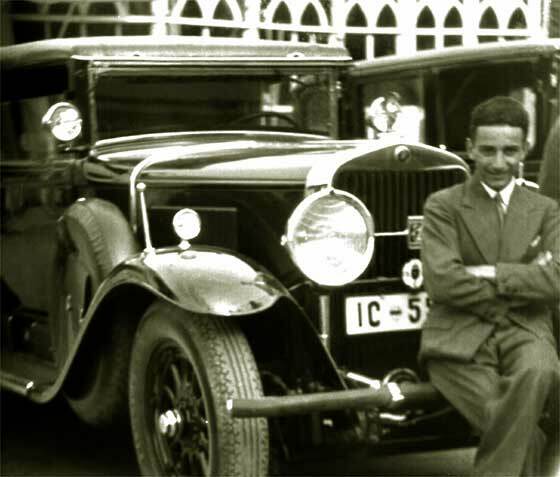 Louis Coalten joined in 1909 designing quality performance cars and Grand Prix cars. 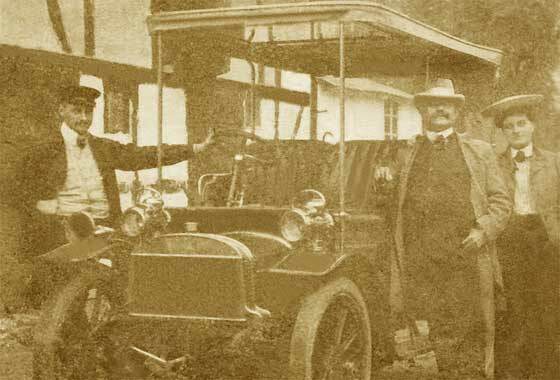 Amalgamated with Darracq in 1920 who had bought Clement-Talbot, and formed STD Motors. STD went into receivership in 1935, purchased by Rootes Group. Photo sent to us by our Singer expert Simon Bishop (UK) saying he received the photo but can confirm it is not a Singer. Any ideas what it is? -- I think it is a Wolseley and our experts agree. The bonnet has two sets of louvers. Multiple sets of louvers was very much a Wolseley thing. A-Z of Cars 1920s shows a Wolseley 12'32 de Luxe Four Door Saloon with two sets louvers. These were made 1927-30. Coachwork, perhaps Weymann. Wolseley made Weymann and own Fabric saloons. Two photos sent to us by Michael Maisey (UK) investigating family history and found photos belonging to his wife's father now deceased. They came from Konigsberg (now Kaliningrad) and her great-grandfather was Salomon Aschkanasy 1848-1906. Photo probably taken in Germany. Would be grateful for any suggestions as to the car make, year, etc. -- This did not look a European car so got help from our friends at AACA where Keiser soon identified it as a cca 1929 Cadillac. 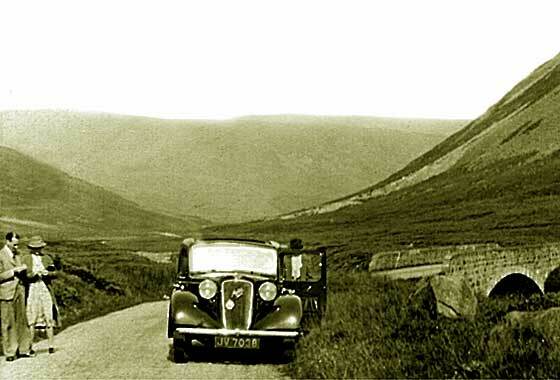 Another photo sent to us by Gillian Fynes (UK) taken on a holiday in Scotland August 1939. Could we tell who it was registered to; perhaps Albert Collinson? -- While we can date registrations, and occasionally our experts may have details copied from local records, - generally only the DVLA can tell if there are any original owners on their records. We can say the reg is Grimsby, and Austin expert Jim Stringer advises the blurry car is probably a late 1938 Austin 18HP York Saloon, 6 cylinder. Two photos sent to us by Michael Maisey (UK) investigating family history and found photos belonging to his wife's father now deceased. They came from Konigsberg (now Kaliningrad) and her great-grandfather was Salomon Aschkanasy 1848-1906. Photo probably taken in Germany. Would be grateful for any suggestions as to the car make, year, etc. -- Done the rounds of our experts and nobody has come up with a positive ID. Suggestions of Adler and Laurin & Klement. 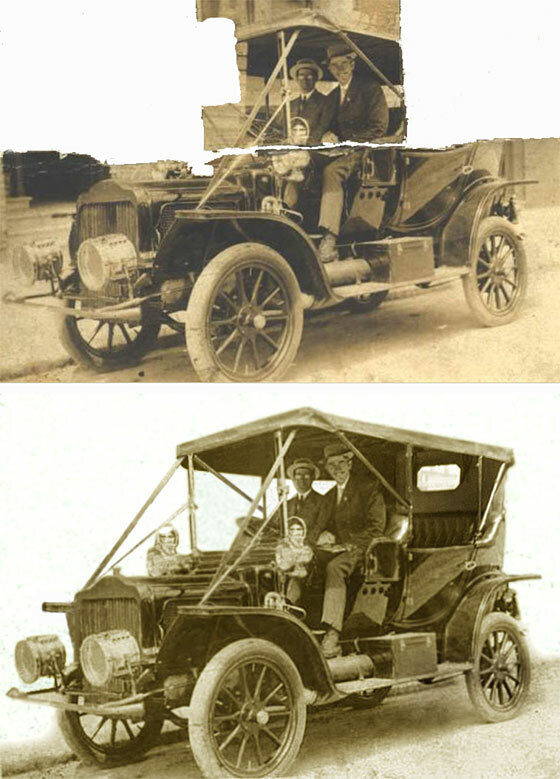 Two photos sent to us by Rosalie Cagnini (USA) saying she needs some help identifying this car. Is it a Ford Model T? 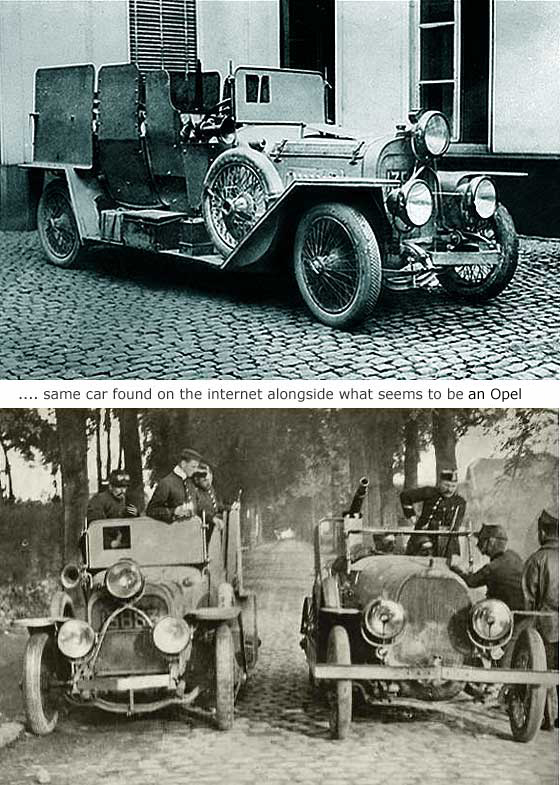 -- No it is not a Model T, and at this stage we are not able to tell what it is. Photos taken from the back are notoriously difficult to identify. We have tried our experts here and have asked our friends at the AACA but nobody has come up with anything. The roadster could be one of many makes from around 1918-22ish. Tank between the rear springs is a pointer. HELP PLEASE !